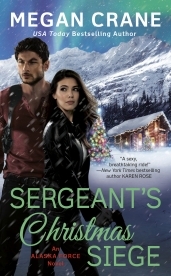 Danger lurks in the wilds of Grizzly Harbor this Christmas but it’s love that has Alaska Force in the cross-hairs, from the USA Today bestselling author of Sniper’s Pride. When straight-arrow, by-the-rules Alaska State Trooper Kate Holiday is sent to investigate a local band of secretive commandos in remote Grizzly Harbor over the holidays, her least favorite time of year, her objective is clear: disband Alaska Force and arrest them. But Kate didn’t count on the diabolical temptation of Templeton Cross. The former Army Ranger exudes charm and has absolutely no respect for the rules of law that govern Kate’s life – too bad he also makes her mouth water and her knees weak. Templeton has always been good at keeping his game face on and his emotions hidden, especially in combat. But working with Kate brings back memories of losses he prefers to keep locked up tight. As the pressure mounts – and Christmas draws closer – it’s a given that someone’s going to get hurt. Trouble is, the more time he spends convincing his careful, wary trooper that there’s more to the holidays than her memories, the more he wants to keep her around. Forever. But forever is the one thing a man like Templeton can’t do. Not even at Christmas. Sign up to be notified when this content is posted. What’s the difference between a Harlequin continuity series and your own series?